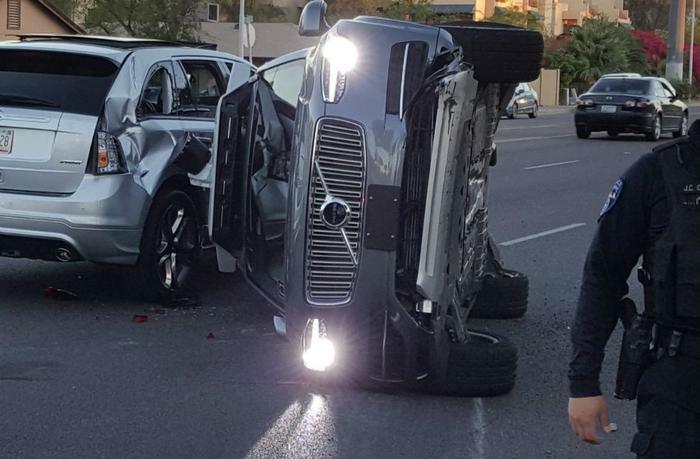 Uber's self-driving cars are on the road again, just a few days after one of their Volvo SUVs overturned following an intersection crash in Tempe, Arizona. Uber paused the program after the accident last week but quickly put its cars back on the road in San Francisco Monday and said it would return to the streets of Tempe and Pittsburgh later in the day. There was general agreement that the accident was caused by a driver who failed to yield in an intersection and struck the Uber vehicle. That explanation isn't going over well with some safety advocates, including John Simpson of Consumer Watchdog, a non-profit group headquartered in Santa Monica, Calif.
Tempe police ticketed the driver of the other vehicle in the Uber crash. Nonetheless, Consumer Watchdog said, the incident raised the question of who is at fault when a robot car causes a crash. Consumer Watchdog said that while the driver of the other vehicle may have technically been at fault in the Arizona Uber crash, it could well be the case that the robot vehicle did not behave as a human-driven car would have, contributing to the crash. The group called on Uber to take the Safe Autonomous Vehicles (SAVe) Campaign pledge and agree to accept responsibility when one of its self-driving cars causes a crash, and also called on Uber to release all video and technical details related to the Friday crash. Earlier this month the SAVe Campaign asked eighteen automakers and developers of self-driving cars, including Uber, to take responsibility for failures in their automated and autonomous vehicle technology. Only Volvo accepted the challenge and agreed to accept responsibility for their robot cars at some levels of automation. Uber has finally received permits to test in California. It will be required to file public crash reports when an incident occurs and annual disengagement reports detailing when the robot technology fails. The reports are posted to the DMV website.